These Chocolate Chip Muffins reminds me of my childhood. Growing up, my mom would make these muffins on Sunday’s after church. 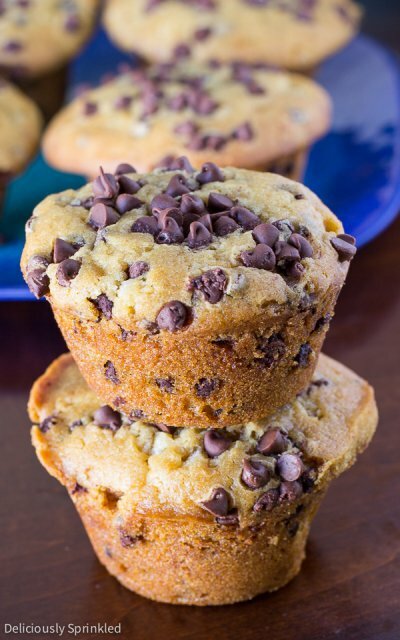 My brother and I always made sure we were on our BEST behavior at church so that when we got home we could have one or two of these amazing Chocolate Chip Muffins. PRE-STEP: Preheat oven to 425F degrees. Lightly spray 12 muffin cups with non-stick cooking spray or line with muffin liners. STEP 1: In a medium bowl, whisk together flour, baking soda, baking powder, and salt. Set aside. STEP 2: In a large bowl, using an electric or stand mixer combine brown sugar, butter, egg, vanilla extract, and buttermilk, mix until combined. STEP 4: Mix flour mixture until just combined. MUFFIN BATTER WILL BE THICK! STEP 5: Stir in mini chocolate chips. STEP 6: Using an ice cream scooper, scoop muffin batter into prepared muffin tins.Press additional mini chocolate chips onto the tops of each muffin. STEP 8: Bake at 425F for 5 minutes. Keeping the muffins in the oven, reduce the oven temperature to 350F and continue to bake for 12-15 more minutes or until a toothpick inserted in the center comes out clean. STEP 9: Let muffins cool for 5-10 minutes before enjoying!